Daytona lovers know the nostalgia and memories of Daytona Beach last a lifetime and Daytona is the perfect beach destination to visit for any special occasion. This year, stay on the beach and close to all the Fourth of July events with Nautilus Inn! Located within a couple miles of the area's most popular attractions and the Daytona International Speedway - choose between our four various types of rooms available, all with private balconies and ocean views. Our beachfront hotel will impress your whole group and our rates even include daily continental breakfast and cocktail hour! It's easy to plan your Fourth of July vacation in Daytona Beach with the area's variety of events and family-friendly activities. Your family will love the excitement of fireworks over the Atlantic Ocean after the Daytona Beach Bandshell's annual concert. This year’s line-up is one of the best: Eagles tribute band: Alter Eagles, Wednesday, July 4, 7:00 p.m. U.S. Navy Band, The Cruisers, Thursday, July 5, 7 p.m. Doobie Brothers and Santana tribute bands: China Grove and Supernatural, Friday, July 6, 7:00 p.m. Lynyrd Skynyrd tribute band: Nuthin' Fancy, Saturday, July 7, 7:00 p.m.*. In addition, the Coke Zero Sugar 400 - NASCAR Sprint Cup Series storms in on Independence Day weekend. One of NASCAR's most anticipated events, the Coke Zero Sugar 400, brings together NASCAR racing under the lights with pageantry and patriotism to make for an Independence Day weekend celebration unlike any other. This fan-favorite event includes some of the most exciting racing of the season as drivers battle three-wide for a coveted DAYTONA victory. 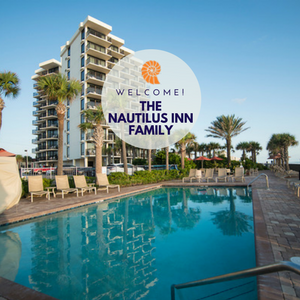 Celebrate the Fourth of July at Nautilus Inn and experience why nothing is like a family vacation in Daytona Beach, Florida! 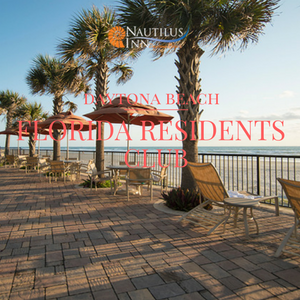 From our beachside location in the center of everything Daytona Beach has to offer - the Nautilus Inn is the perfect destination to make Fourth of July weekend memories!